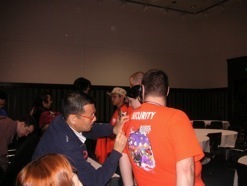 Few people have been involved in the Robotech world as long as writer Kenji Terada. Of the three animated series that were merged to create Robotech, Terada wrote two of them - Super Dimension Cavalry Southern Cross and Genesis Climber Mospeada. Two decades later, when the American company Harmony Gold was trying to complete a new Robotech epic, the Shadow Chronicles, they turned to Terada to help complete the first American episode in the Robotech series. 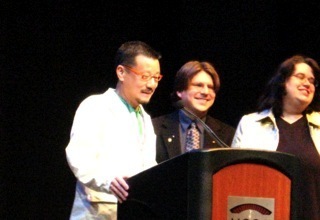 "It's heartwarming to know that something from back then is still being consumed and enjoyed," Terada said about the enduring appeal of Robotech when he appeared at Anime Boston. But Robotech isn't the only endearing series for which Terada wrote the screenplay. In the early days of U.S. anime fandom's growth in the late 1980's and early 1990's, two series that attracted English-speaking fans were Dirty Pair and Kimagure Orange Road. The series had different premises, with Dirty Pair being an action series and Orange Road a romantic comedy with an ESP twist. Terada wrote both of them, along with 1990's fan favorite Ushio and Tora. 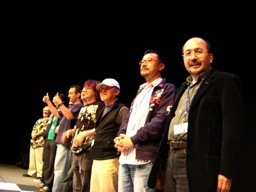 And to emphasize his versatility, Terada also was one of the lead writers of the first group of Final Fantasy games.